Some agencies wish to add a markup to the cost of traffic to reflect the fees they charge a client. For example, Agency A charges Client X 20% on top of the cost of traffic. So for every $100 in network spend they would like to show their client the spend with markup of $120. By adding a markup to your Report dashboard, all the Spend Values and any value calculated off of spend (CPC, Cost per Install, Cost per Action, etc.) will be increased by the markup percentage. Markup is set at the dashboard level. To add markup to a preexisting dashboard, click the Edit Dashboard icon in the upper right-hand side of a dashboard. All values will be marked up on the dashboard as well as any dashboard links or pdfs generated by the dashboard. 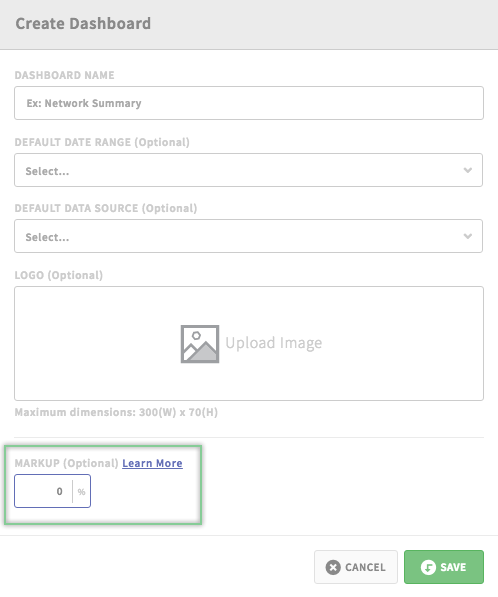 If the markup is changed, the dashboard will refresh with the new markup BUT any prior dashboard links or pdfs will show the markup that was in place at the time they were generated.